A milestone has been reached in the construction of the new Exposition Center at the New York State Fairgrounds as the final piece of structural steel to be installed was placed in the roof of the building. Gov. Andrew M. Cuomo announced on May 21 the achievement of a milestone in the construction of the new Exposition Center at the New York State Fairgrounds as the final piece of structural steel to be installed was placed in the roof of the building. 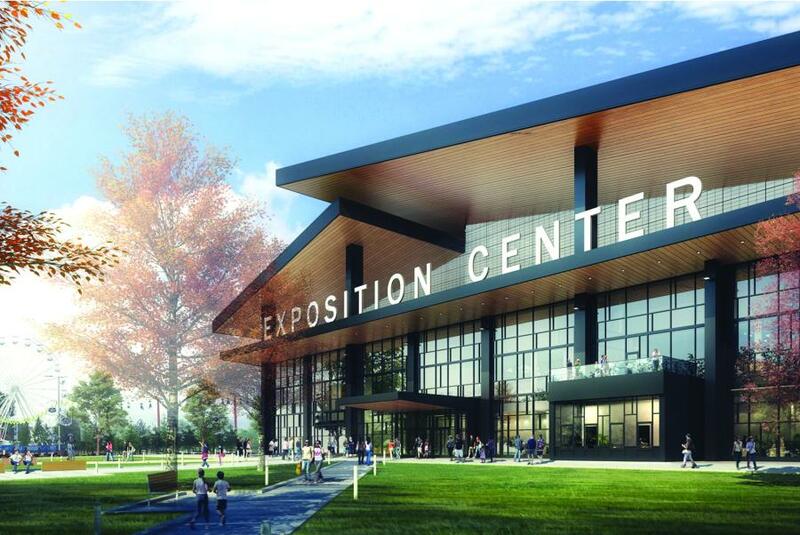 When the Expo Center opens for the 2018 Great New York State Fair, the 136,000-sq.-ft. structure will be the largest indoor events space north of New York City between Boston and Cleveland. This new facility, along with the ongoing renovation of the Fair's Orange parking lot, marks the second phase of the Governor's $120 million plan to revitalize the State Fair and Fairgrounds and complements Central NY Rising, the region's strategy to grow the local economy. 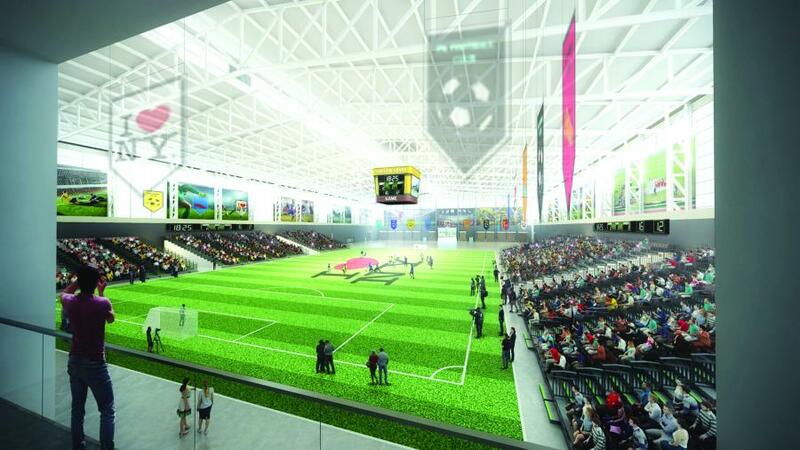 The Expo Center, with 110,000 sq. ft. of clear-span event space, will have the capacity to hold more than 500 10 ft.-by-10 ft. trade show booths and 4,000 retractable seats. This flexible event space will attract major shows and special events, including car, boat and RV shows, pet expos, consumer and trade shows, home and garden shows, tech expos and other events that were previously unable to come to upstate New York due to lack of suitable space. The building will join the fairgrounds' existing portfolio of event space, such as the Toyota Coliseum and the Center of Progress Building, increasing the amount of available indoor space on the grounds to more than 450,000 sq. ft. Construction of the facility is expected to create more than 700 jobs. Since the beginning of renovations, State Fair attendance has grown by more than 28 percent and non-fair event estimated attendance has grown 57 percent from 2016 to 2017. Under the first phase of Gov. Cuomo's revitalization plan, the fairgrounds were transformed to include 63 acres of newly opened space to accommodate a full-service RV park for 313 campers, a reconfigured and larger midway area that serves as on-site parking or event space outside of the fair, and open space for fair programming, non-fair events, and for construction of the Exposition Center. A new main gate entrance also was built, along with a new exhibit area for the New York State Police and the Sky Ride, a 1,400-ft. long chairlift ride. The Indian Village also received renovations for its Turtle Mound, the home of cultural performances during the Fair. This announcement complements “CNY Rising,” the region's comprehensive blueprint to generate robust economic growth and community development. The state has already invested more than $4.7 billion in the region since 2012 to lay the groundwork for the plan — capitalizing on global market opportunities, strengthening entrepreneurship and creating an inclusive economy. Unemployment is down to the lowest levels since before the Great Recession; personal and corporate income taxes are down; and businesses are choosing places like Syracuse, Oswego and Auburn as a destination to grow and invest in. Now, the region is accelerating CNY Rising with a $500 million state investment through the Upstate Revitalization Initiative, announced by Cuomo in December 2015. The state's $500 million investment will incentivize private business to invest well over $2.5 billion — and the region's plan, as submitted, projects up to 5,900 new jobs.